You will find the links for Shirley, Lidy, and Mary at the bottom of this post. Our common theme for today is spring bulbs. 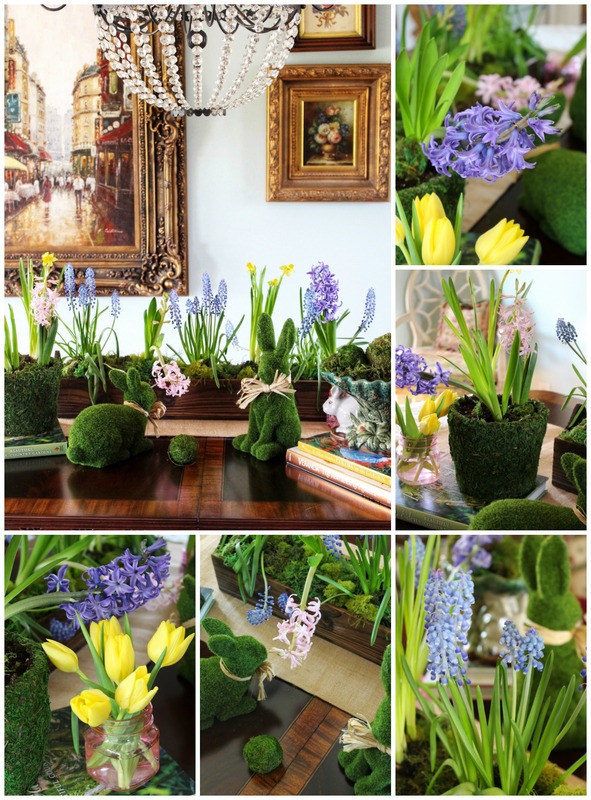 I gathered tulips, hyacinths, daffodils, and grape hyacinths to provide a breath of spring on my dining table! 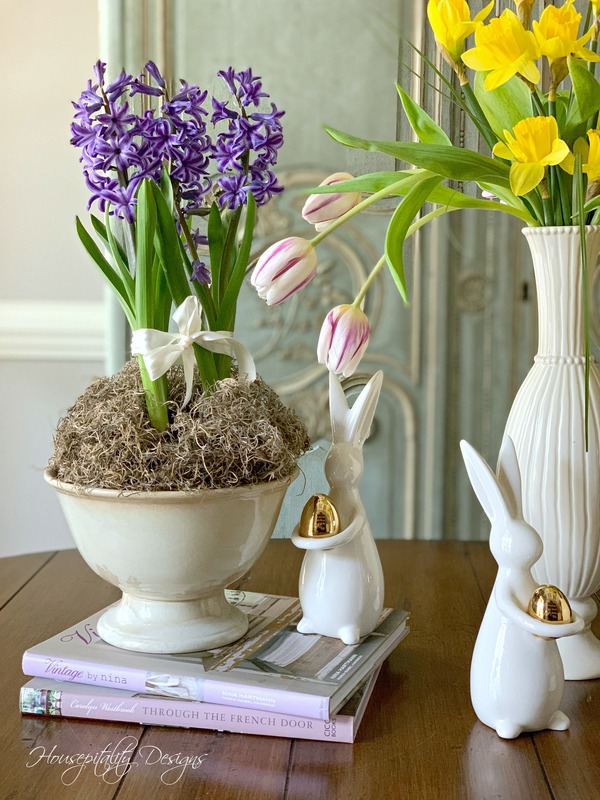 I placed a burlap runner on my dining room table and filled a rustic box with potted grape hyacinths, a pink hyacinth, and miniature daffodils. A couple of moss bunnies decided to visit the garden by way of TJ Maxx! One of the bunnies was smitten with the fragrance of the hyacinths! Since potted tulips were unavailable, I used cut tulips and simply placed in a pretty pink jar. 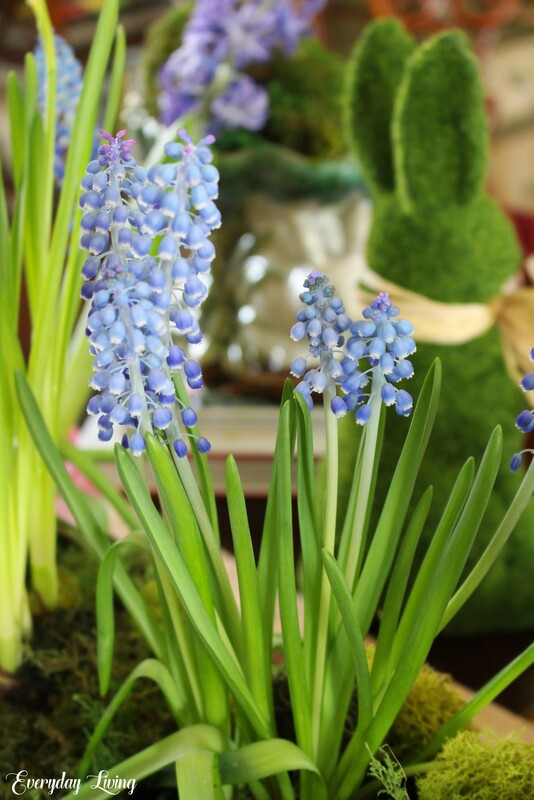 Grape hyacinths appear as tiny clusters of blue pearls with somewhat floppy leaves and are an early spring bloomer. 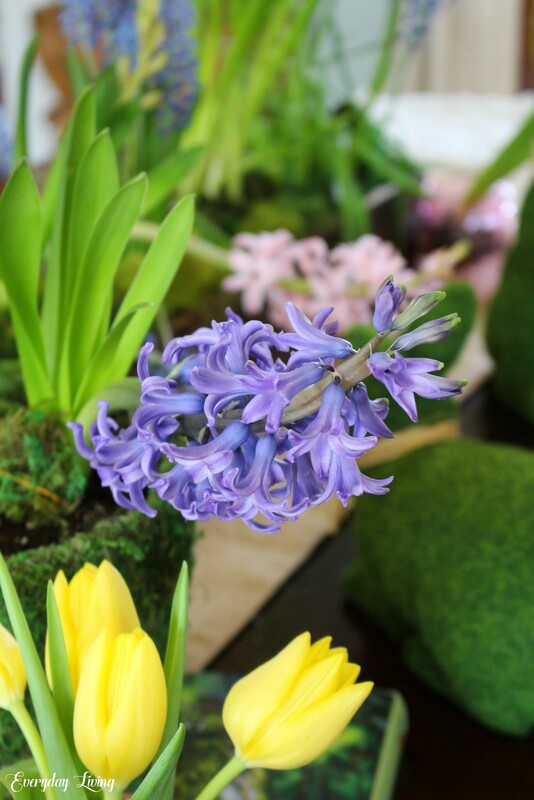 They are not a true hyacinth, but a member of the lily family. Do you see my moss pot? Most of you know I am not a DIY blogger, but I did make this moss pot which was so easy. When I was a young newlywed I signed up for every craft class that was available…decoupage, stain glass, cross-stitch, and smocking just to name a few. I guess you can say, it was not my cup of tea, but I do admire my blogging friends that handle a DIY with so much ease. Tete-a-Tete daffodils are miniature flowers, but planted in mass make a lovely showing in the garden. With a little tweaking, my garden table will be in service for a spring buffet‭! 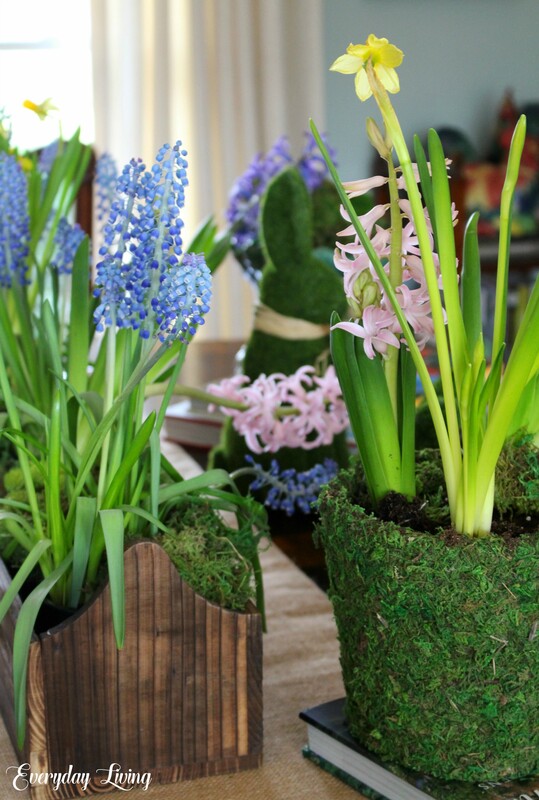 The heady fragrance of hyacinths is uniquely spring. They are a perfume powerhouse in the garden or on my dining room table! Be sure to visit my talented friends at the links provided below! Thank you for your lovely visits and comments that you leave. I wish you a wonderful week and a beautiful arrival of spring! Thank you dear Mary. A week of sunshine is a welcomed change! 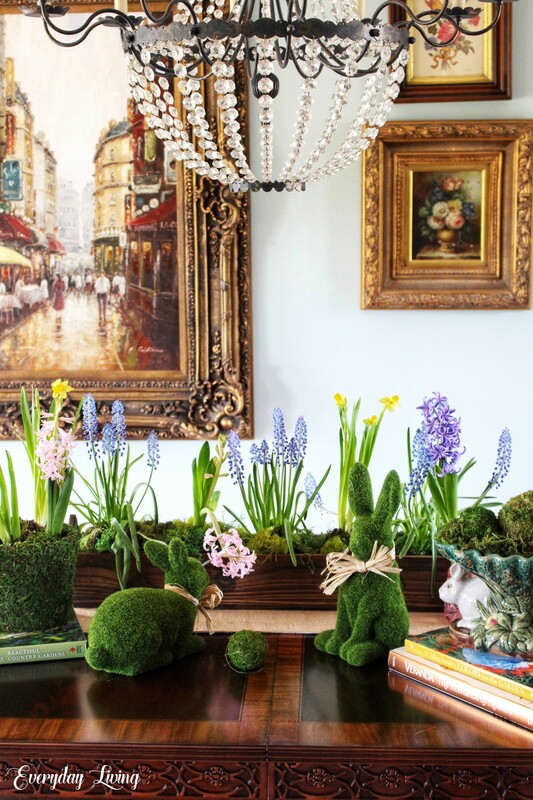 Pam….oh how beautiful…Spring is definitely in the air in that beautiful dining room and the most adorable moss bunnies are a joy to see! I so love the quotes of Spring, Dickens, Hepburn, however, the scripture from the Song of Solomon said it best! You always uplift us with such beauty and inspiration and thank you for this! I cannot wait to get to the garden centers and plant some things on the porch (my only Spring planting area this year). 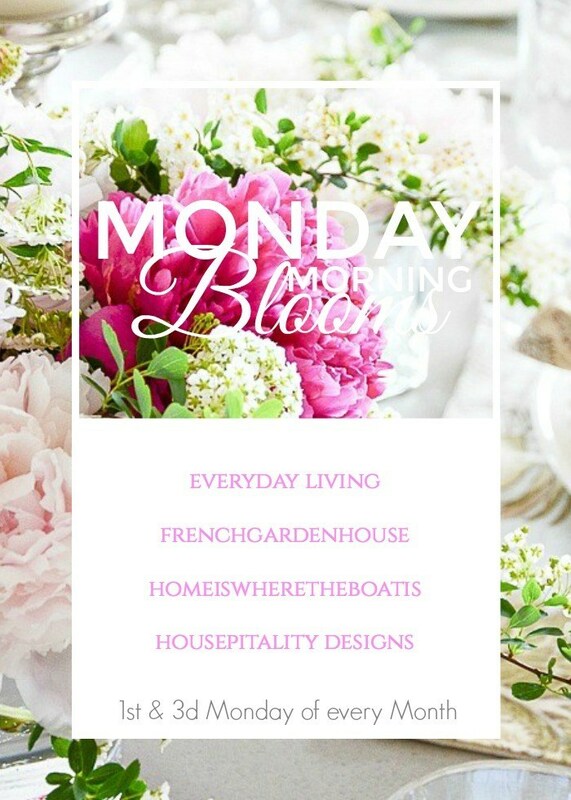 Another Monday Morning Blooms day filled with joy and happy!! Have a wonderful day and Happy Spring. Thank you dear Shirley. I will be looking forward to your spring porch! This is so delightful Pam! Those moss bunnies are just adorable! 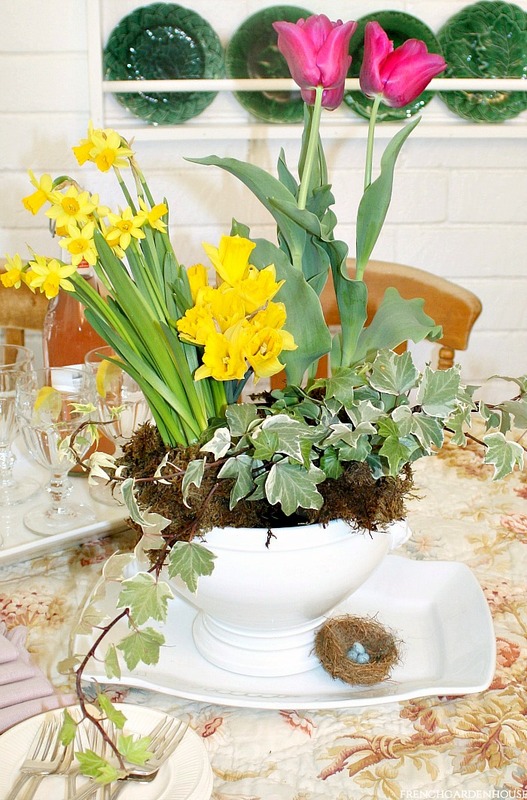 Love your moss pot to and the flowers blooming down the center of your table is gorgeous! 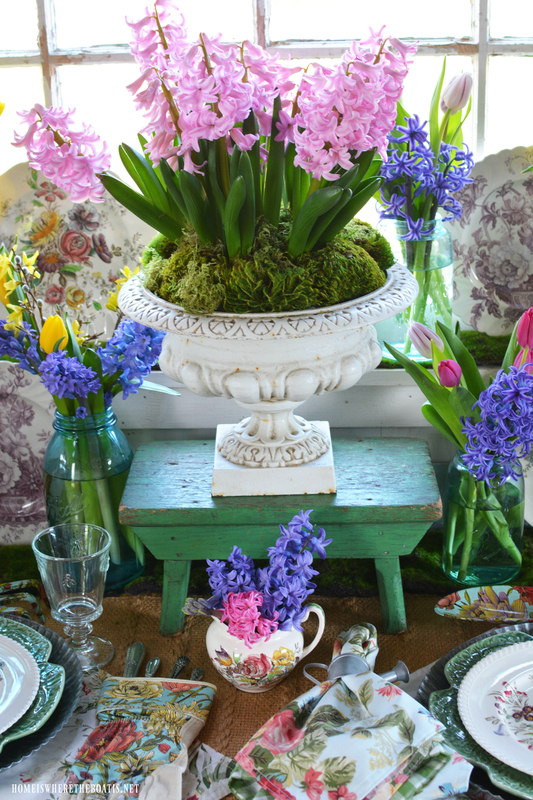 the moss is so pretty against your beautiful table…I think Spring has finally really arrived! Enjoy this week of sunshine! What a wonderful way to begin the week, with Monday Morning Blooms! Thank you Jenna! I am excited for a week of sunshine! Oh, my! This is just beautiful! And, I think your DIY skills are perfectly in tact, sweet friend! I love the verse you shared from Song of Solomon. It so accurately describes springtime. Have a wonderful day! 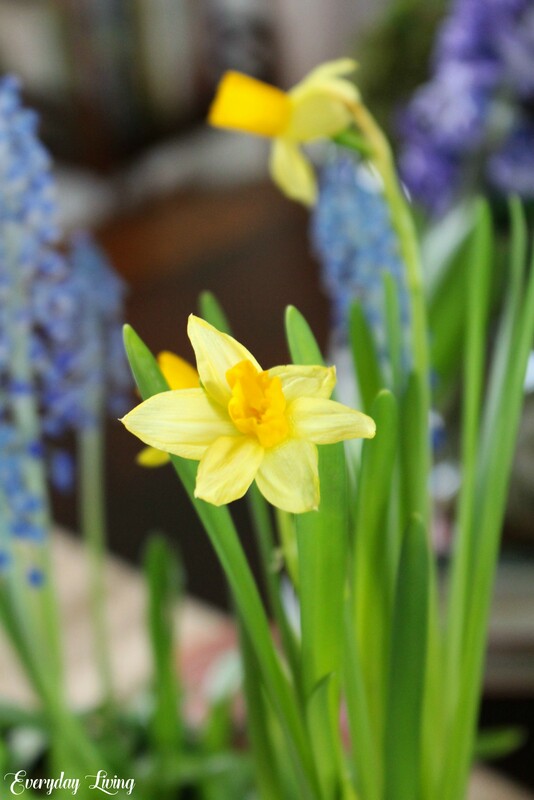 My hyacinths and daffodils are blooming now too! I am delighted with the spring color, and it should warm up enough by the end of the week to go hiking. And, your table is just beautiful!! Carole, I know seeing the signs of spring are a welcomed sight! Hiking sounds great as well. Such a beautiful tablescape to well Spring. So springy! I bet it smells lovely. Your moss pot turned out great! Thank you Penny, it was actually quite easy to do! Happy Monday! Pam, your table is beautiful. I love, love the moss bunnies. One looks like he is poised to nibble in the flowers, just like they do here in my garden! This week I had a beautiful fox, wild turkeys, and more deer strolling down the driveway…everything is definitely waking up around here. Echoing everyone else who said your quotations are perfect. I’m writing all of them down in my book of quotations. Thank you dear Roxanne. Wild turkeys and deer are daily visitors here, and they seem to be everywhere now. There has been a population explosion for sure! Have a wonderful week! Thank you Kari. I also love the scripture found in Matthew 6, the Sermon on the Mount chapters are so rich! Wishing you a great week sweet friend. Don’t you love moss bunnies? I do! 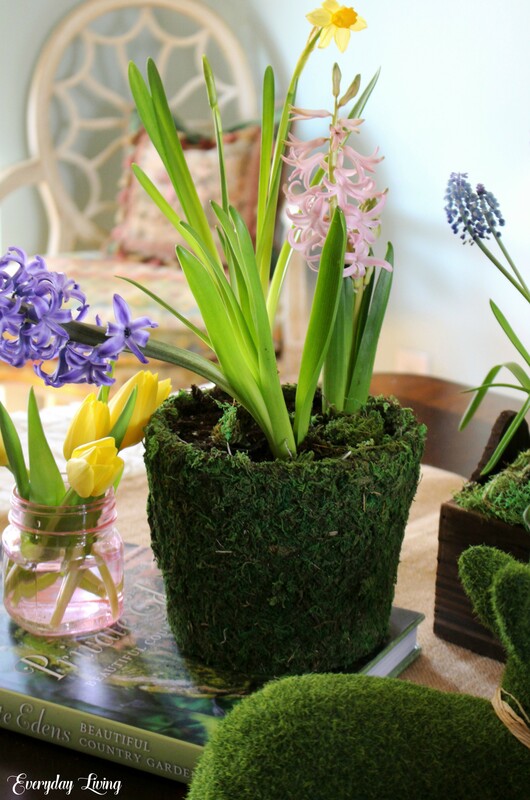 And combined with your spring bulb blooms they are simply perfect. I bought some tulips yesterday and maybe more or daffs. I don’t want to get ones that are ALL OUT but still have some life to come! SO pretty — you inspire. Jeanie, thanks so much. I do love moss bunnies! I just love this bright and cheery table! 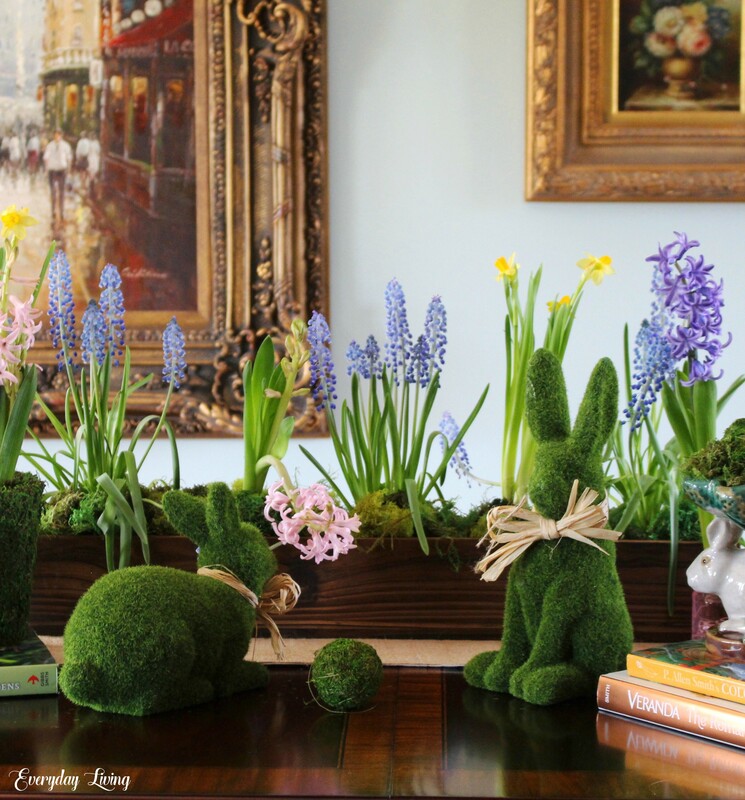 Makes me want to bring my moss bunnies back out and grab some burlap for an outdoor table no matter what the temperature is outside. Thank you Christine. Unfortunately, we are expecting frost tonight! Thank you Cindy. Have a great week! Thank you Maureen. We are expecting frost tonight, so some of my budding roses and bushes will be impacted for sure. Clara, the sunshine has been beautiful today. We are expecting frost tonight and I fear that my Lady Banks and Snowballs will be bitten. They are much too large to attempt to cover. Wishing you a joy-filled week! Your table is so happy! You always warm my heart and brighten my day, thank you Pam. How sweet, thank you Sue! Pam your flowers are lovely. No flowers yet here in New York. Thank you Marilyn. Have a wonderful week! Love the bunnies. They are so cute. Pretty Spring flowers. Thanks so much Marion. Enjoy your week! Gisella, I didn’t realize you lived in New York. Do you like it? Are you from Spain or Portugal ? Our three visits to Italy were wonderful! Welcome back! 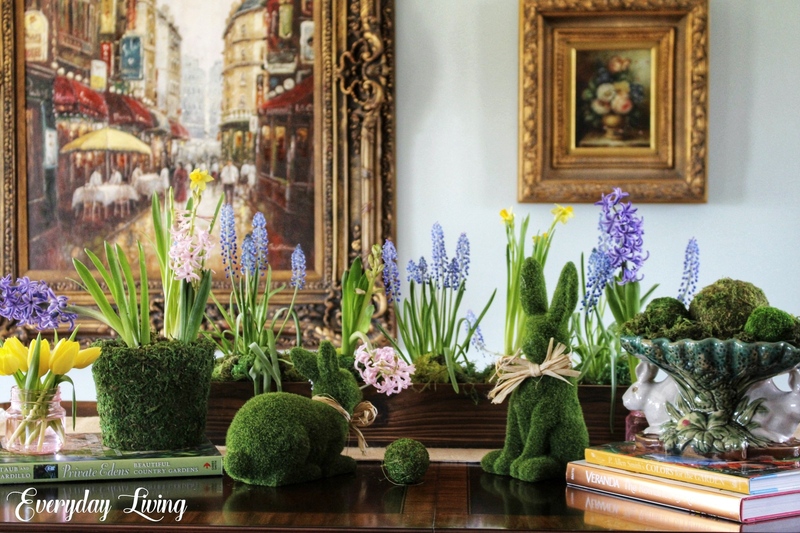 Pam, your blooms and bunnies definitely speak of spring. Lifts my heart to see all the beautiful flowers and the moss bunnies are adorable. The scripture you chose was perfect with this post. Thank you for inspiring us and adding so much joy to our days. Marvelous! How inspiring and charming!Hugs! Oh oh oh! Pam you have outdid yourself now! 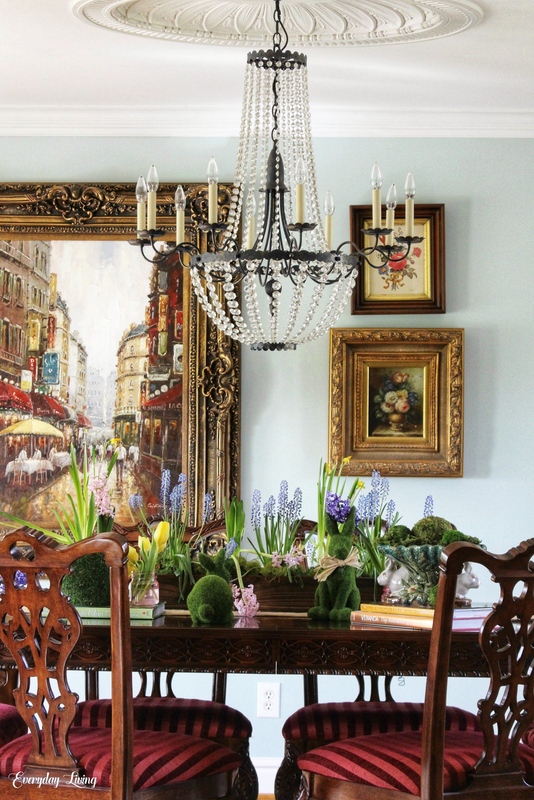 Such a gorgeous spring dining room! 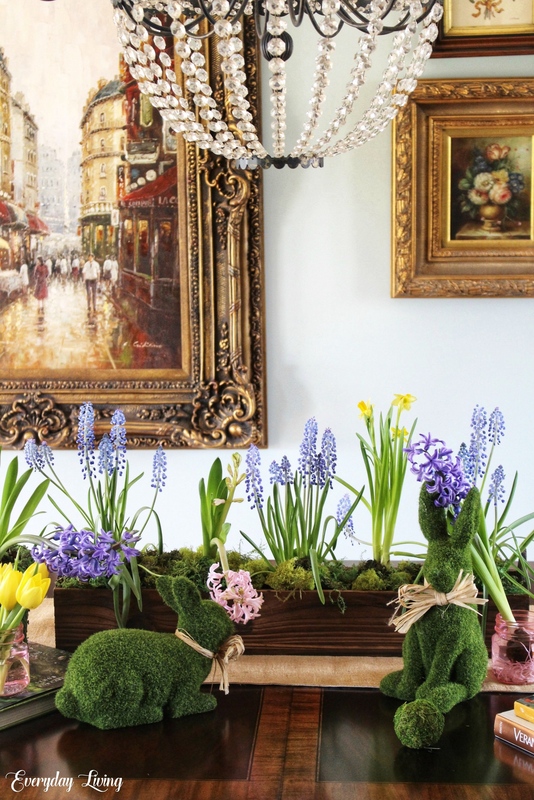 The outside comes in with the spring blooms and green moss! Oh, this is so pretty, Pam! What a stunning presentation on your dining room table! 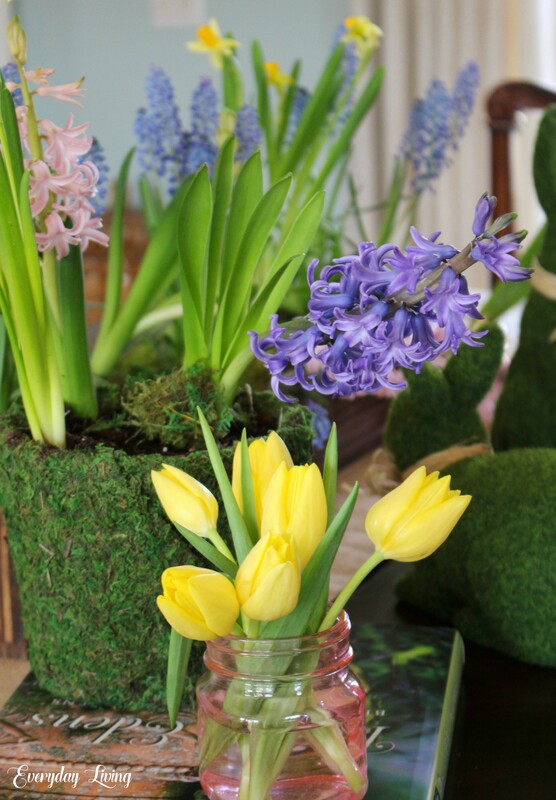 The spring florals in the wooden box, and the sweet yellow tulips in the pink jar are absolutely beautiful! 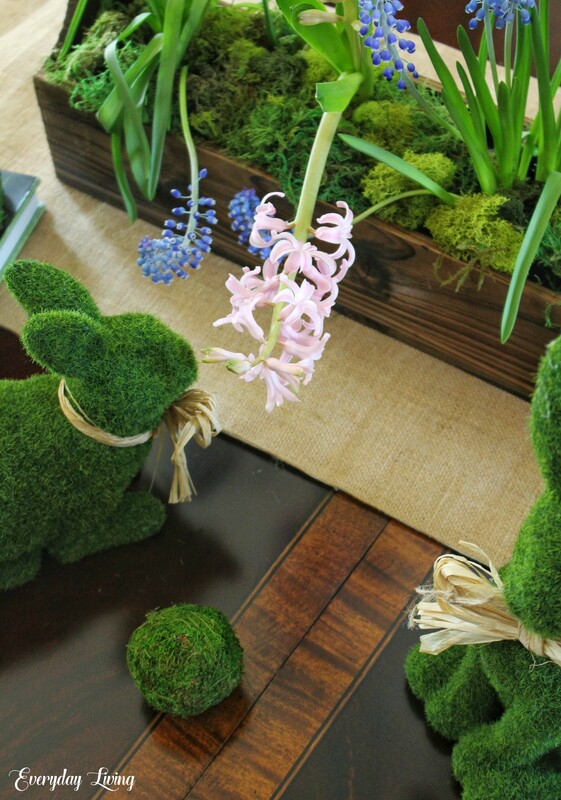 The sweet moss bunnies make a most adorable accompaniment to your display! Sorry, I am so late commenting. It seems family life has kept me busy lately. I hope you are having a most wonderful week, sweet friend! Simply beautiful and I bet it smells wonderful! Thanks for sharing at TFT! 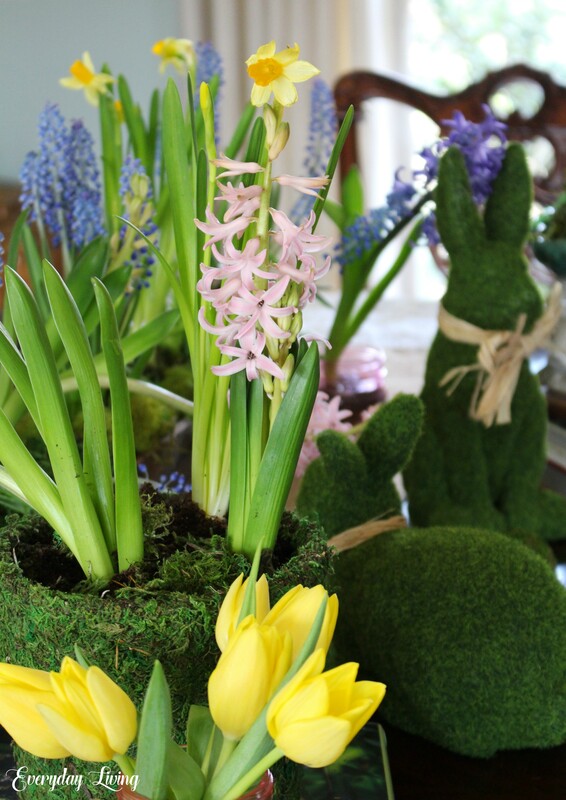 Your table centerpiece and those moss bunnies simply gorgeous dear friend ! 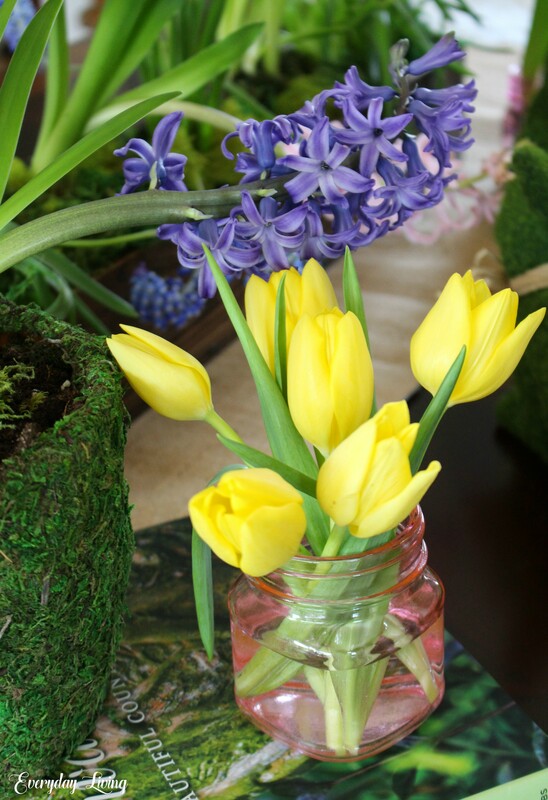 The yellow tulips and the other flowers scream… SPRINGggg !!! Hope you’re having lovely weather to go with this beautiful dining table decor too.